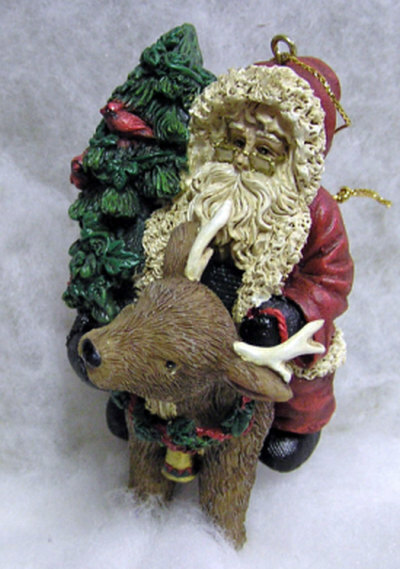 Manchester Cottage has many different ornaments that can be used for Christmas or any time of the year. 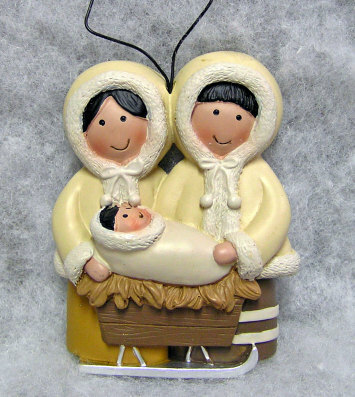 You can use them on your tree, as a package decoration or small gift, as well as other things. Have fun browsing through our ornament department and use your imagination for their uses. This is a Manchester Cottage unique design ornament. It features a wax s'more with a snowman face and is mounted on a wooden base with bark and has a wire hanger. It measures 2 1/2 x 2 x 2. These resin sheep come in three styles: "Love", "Joy", and "Peace" Sheep. They have woolly coats and black face and legs and wire hangers. They measure 2 1/2 x 3 x 1/2 + hanger. 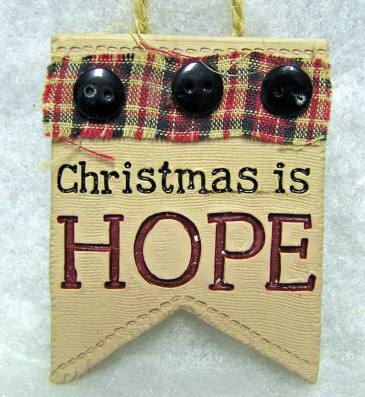 This resin ornament has the saying "Christmas is HOPE" engraved on the front. 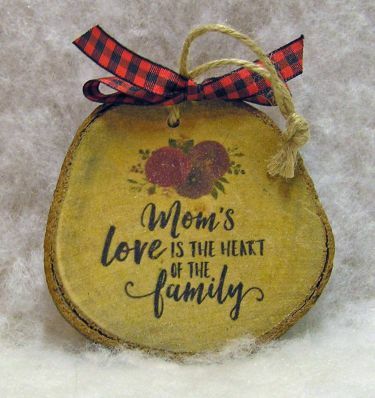 It has a plaid fabric strip at the top with little black buttons and a jute hanger. It measures 2 1/2 x 2 x 1/2 + hanger. 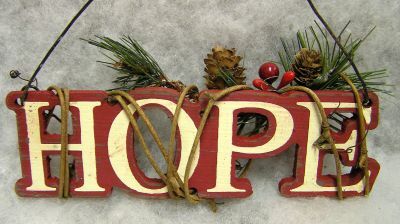 Pine cones, greens and berries are on top of this wooden ornament that says "HOPE". It is wrapped in wooden twigs and has a wire hanger. It measures 2 1/2 x 6 x 1. "THIS IS CHRISTMAS" is engraved on baby Jesus' blanket. 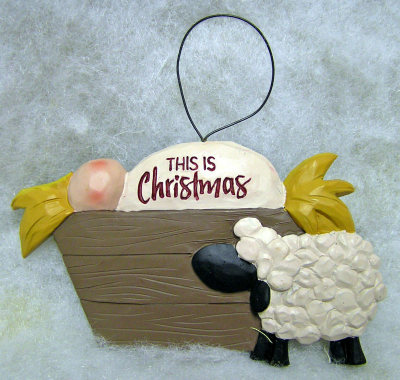 This resin ornament also features a manger with straw and a little sheep keeping watch over the baby. It has a wire hanger. This measures 2 1/2 x 4 1/2 x 1/2 + hanger. 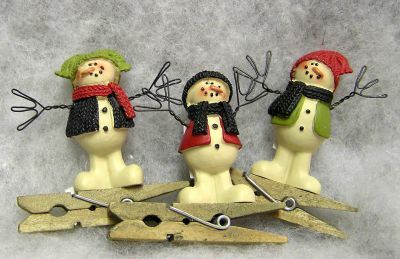 These little resin snowmen have vests, scarves, hats, and wire arms. They are mounted on a clip and can be used in many different ways. They measure 2 x 2 x 3/4. 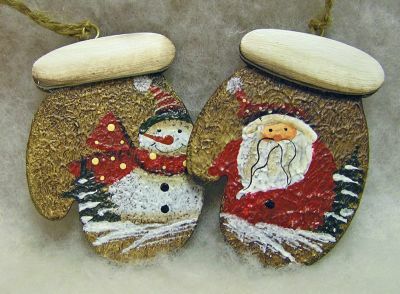 These wooden ornaments are shaped liked mason jars and come in two styles: "MERRY CHRISTMAS" and "BELIEVE". They have wire hangers with fabric ties. They measure 4 x 2 1/2 x 1/2 + hanger. 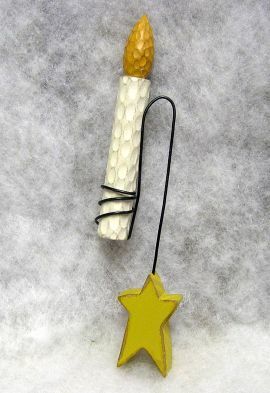 This unique wooden candle is in a wire holder and connected to a wooden star. 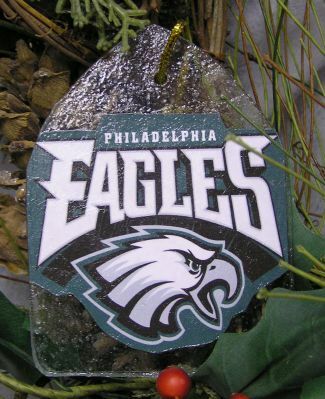 It can be hung over a branch, peg, etc. It measures 6 1/2 x 2 1/2 x 2. 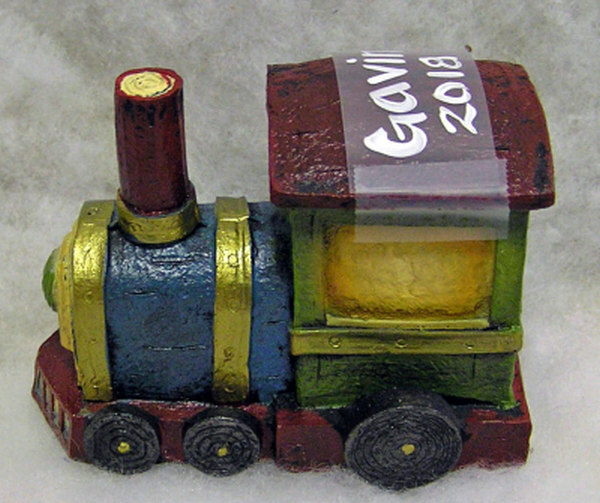 A rusty tin house with cut out windows is the base of this ornament. 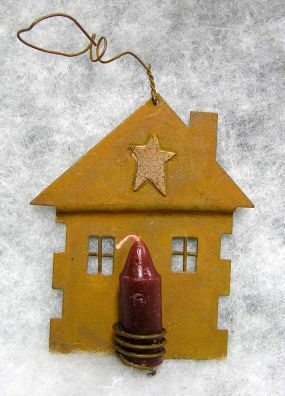 It has a tin star at the top, a maroon candle in a holder at the bottom, and a wire hanger. It measures 3 1/2 x 3 x 1. 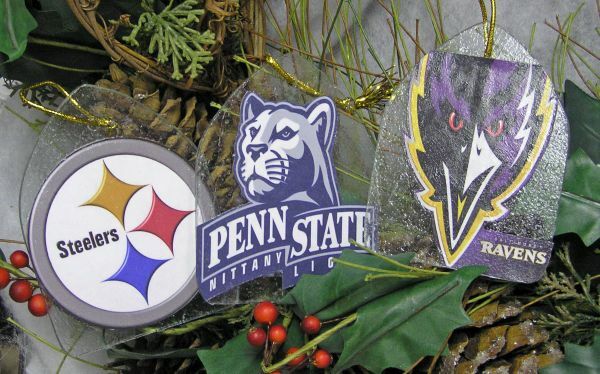 These original glass ornaments feature logos from four teams: Philadelphia Eagles (shown), Pittsburgh Steeler, Baltimore Ravens, and Penn State Nittany Lions (click on photo to see these three options). They measure 4 x 3 x 1/4 + hanger.